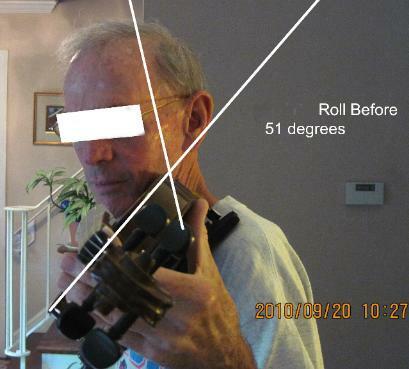 This Gallery presents examples of common problems that occur with a less than optimal set up. The photos show Before and After a fitting. Please Click on a thumbnail to enlarge. 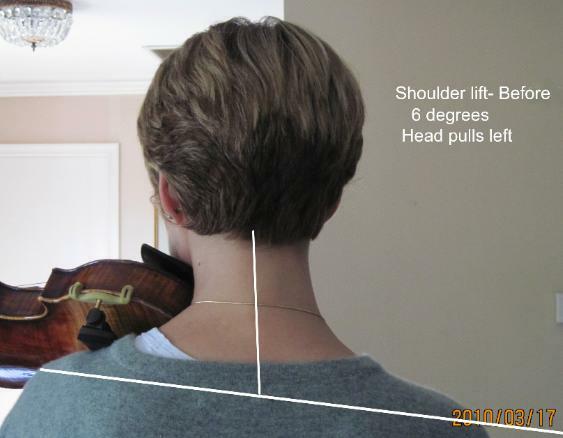 Head leans right due to hard shoulder pad use and down due to incorrect chinrest shape and height. Playing and practicing hurt. With a Frisch and Denig chinrest and no hard shoulder pad the head is nearly directly over the spine. Playing became less of a constant effort. Due hard shoulder pad use and to a chinrest shape that does not fit the jaw, the head tilts right. The properly-fitted chinrest and lack of hard shoulder pad allow the head to sit nicely on top of the spine. 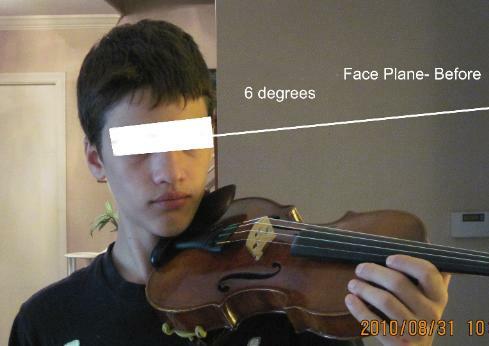 An uncomfortable chinrest shape and incorrect height led this violinist to tilt his head and to hold it one place in order to get comfortable. The fitting yielded a different height and a different shape of chinrest. Now, the head is straight up and ready to move on top of the spine in response to movements of the bow arm. This young man's head position says that he is desparately looking for a place of security and comfort on a chinrest that does not fit him. Head positions tilted right or left, up or down, or pulled forward for a long time lead to pain. 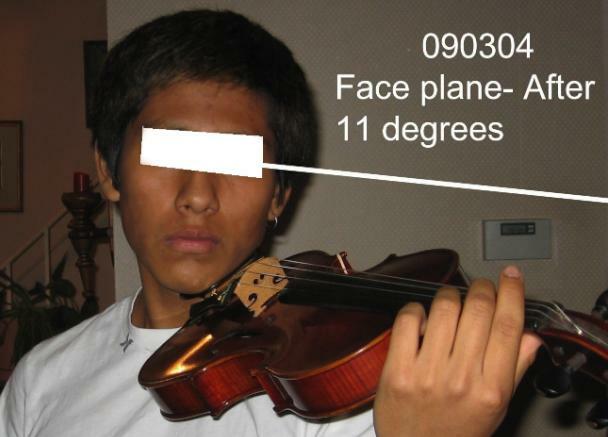 Best is a head position that changes according to movements of the bow hand. 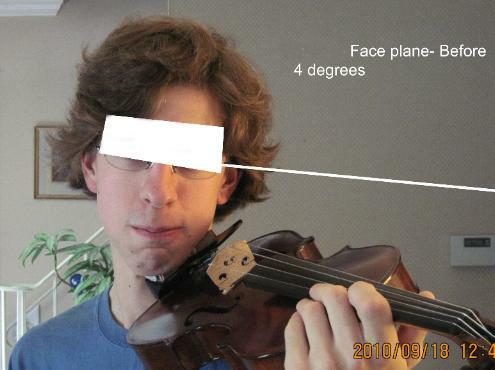 Face plane is greatly improved with a chinrest that fits the individual. 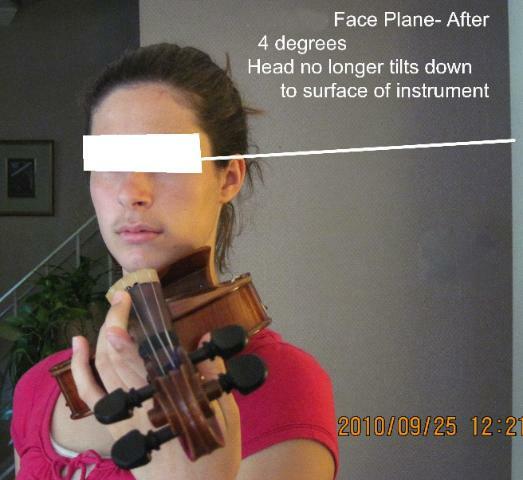 Healthy movement patterns are encouraged once a chinrest fits the player's jaw shape and neck height. 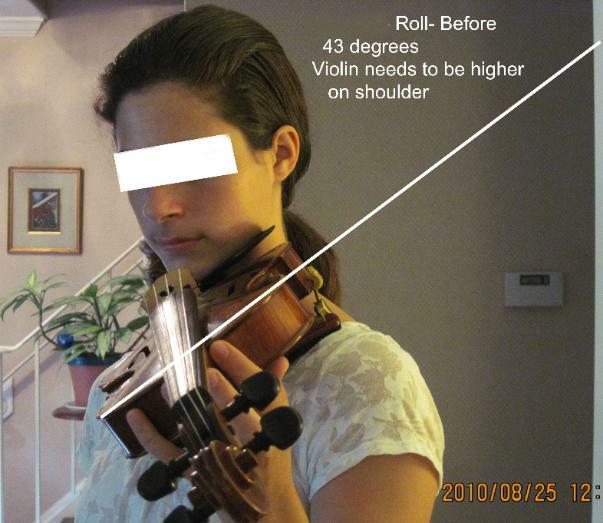 With a hard shoulder pad and incorrect chinrest shape, the violin tilts down to the E string side excessively. Balance of bow weight is lost into the side of the string, and sound and spiccato suffer. Playing is an activity of great effort and pain. 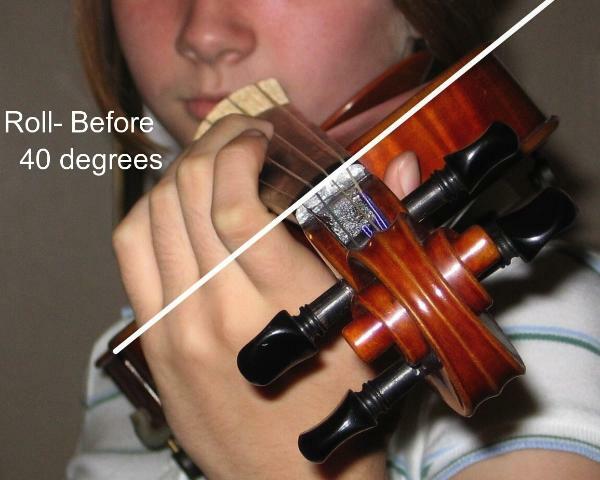 Now that the violin is flatter and the hard shoulder pad feet are no longer covering the violin, sound improves and gravity can be used to get a better, easier spiccato. 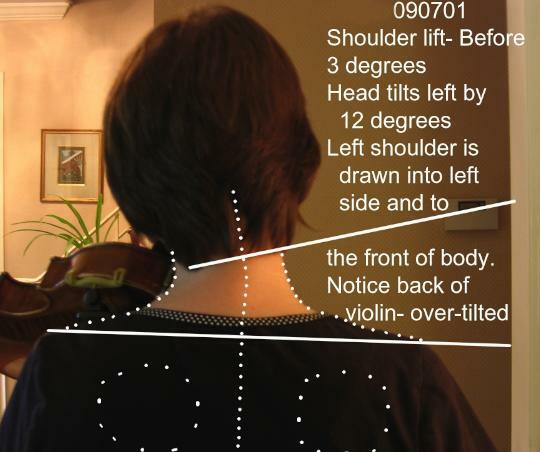 Note that the left shoulder does not touch the back of the violin. The shoulder joint is free to move. Due to the hard shoulder pad pushing up on the shoulder side of the instrument, the roll is excessive. Loss of bow arm balance into the top of the string is the result. Sound and spiccato suffer. Notice also that the bridge is slightly higher than the mouth. When instrument altitude is increased and the hand to mouth relationship is upset, the bow arm must work harder. Sound and musical nuance suffer. Left hand must also reach farther over the bouts in shifting. 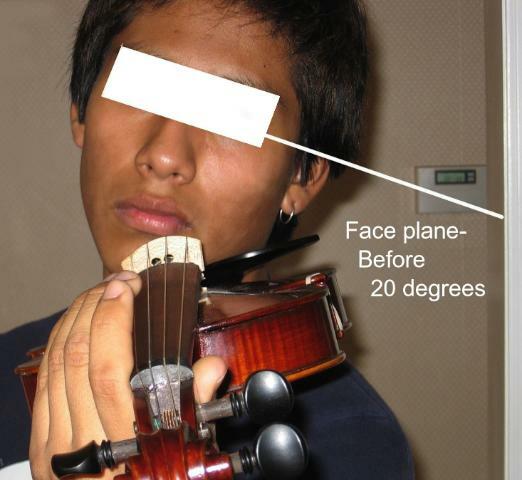 With the chinrest shaped and lifted to fit the player's neck and jaw and with no hard shoulder pad, the roll (tilt of the instrument down to the highest string) is flatter. Sound will improve and spiccato will be more easily produced. Notice that the bridge is now below mouth level. Bow arm and left hand are now in a more neutral position and will function with less strain. 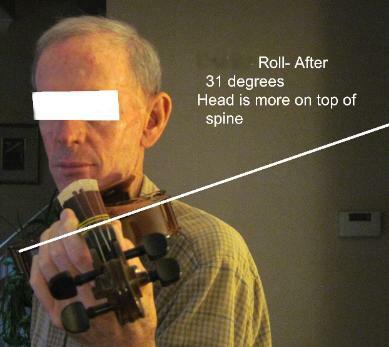 Incorrect instrument placement, the presence of the hard shoulder pad, and less-than-optimal posture have led to severe instrument roll (tilt). 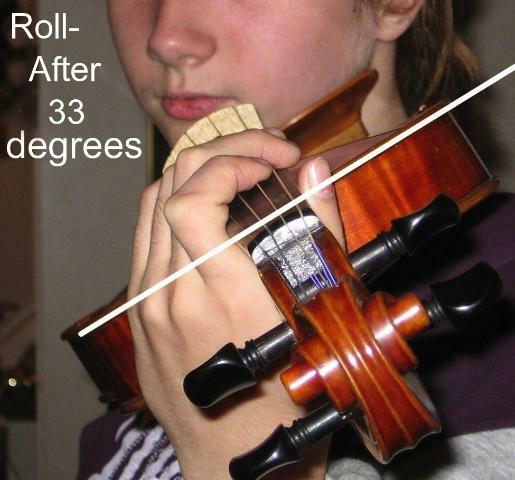 Tone production, shifting, and bounced bow strokes are very difficult with this level of roll. 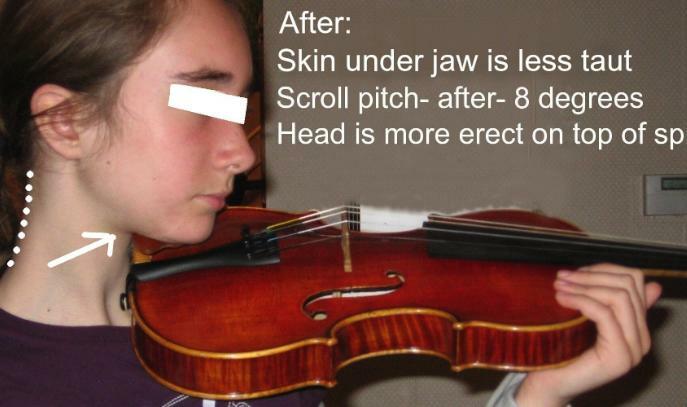 With the instrument now in a slightly better position, after some coaching on posture, without the hard shoulder pad, and with an appropriately-shaped chinrest, this gentleman is much more comfortable and happier with his playing. 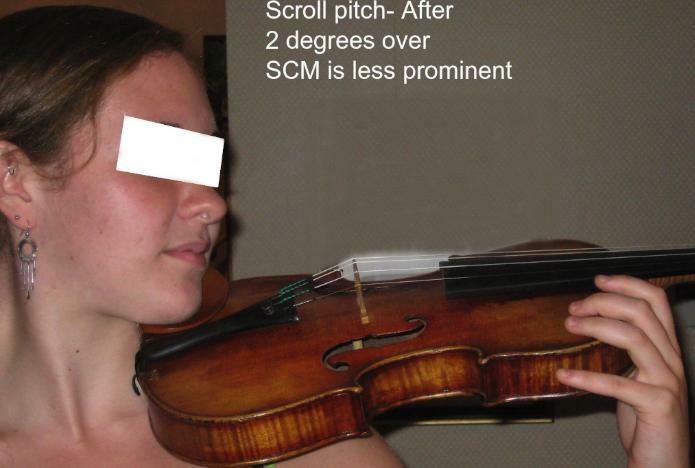 An inappropriate chinrest shape and height lead to a sagging scroll. 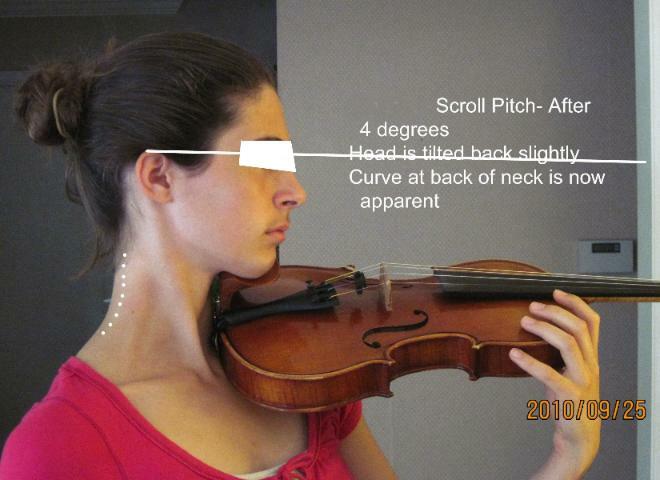 A chinrest appropriate to the player in height and shape allow light head weight to draw the instrument into the neck. A cantilever effect is put into place, and the scroll rises without undue effort. With equipment working against her, this player experienced pain when practicing and playing. 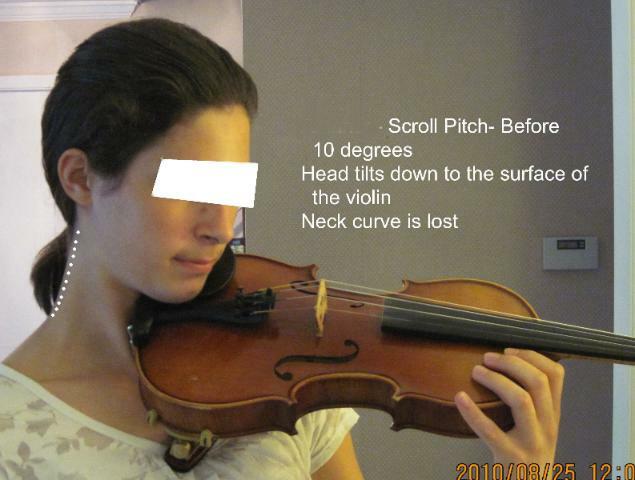 Note that the curve at the back of the neck is missing and that the scroll droops. Scroll droop asks the bow hand to over-stabilize the bow as the bow tries to drift over the fingerboard. 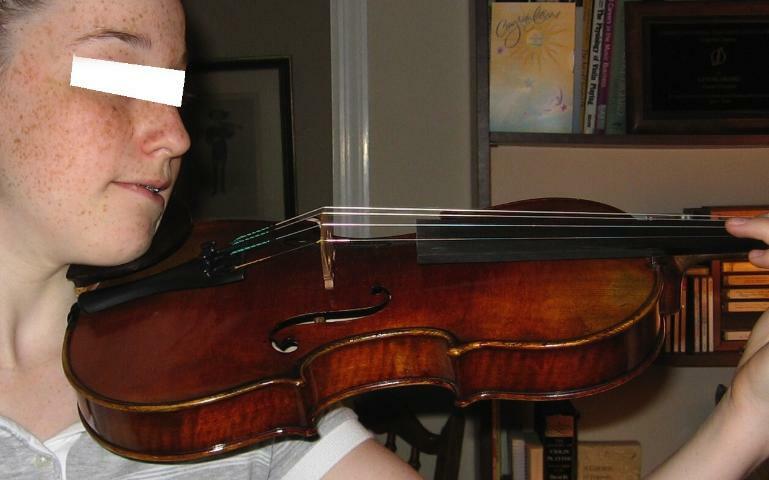 Bow hand flexibility is hindered and musical scope is narrowed. With equipment appropriate to jaw shape and neck height, this player can now stand her full height. 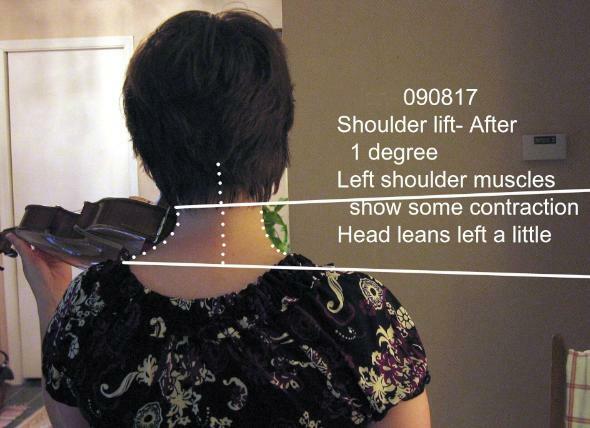 The very healthy curve at the back of her neck is now present, and the head is free to counterbalance movements of the bow arm. 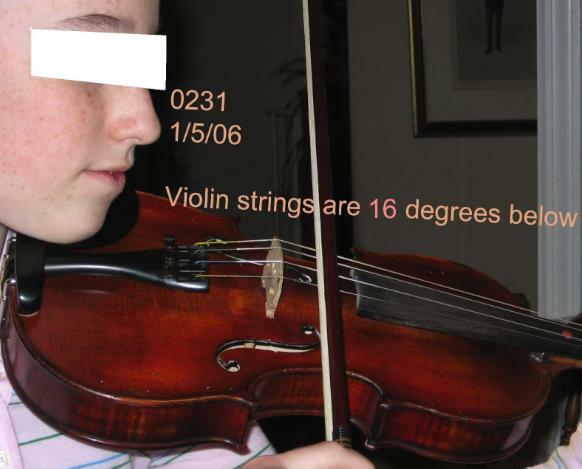 String height is more parallel to the floor and the bow hand is free for artistic touches. 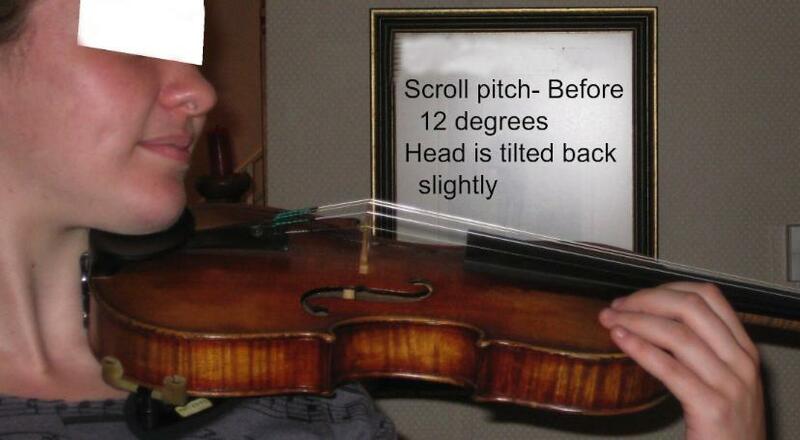 Lack of a properly fitted chinrest and a too-high shoulder pad are causing excessive droop of the scroll. The bow hand constantly plays a "game of catch" in such circumstances taking away some of its responses for nuances in playing. Without the hard shoulder pad and with a chinrest of good shape and height, the scroll is now kept at actually a slightly too-high level. But the difference is very striking between "before" and "after", and instrument balance is done so much more easily than with the old equipment. 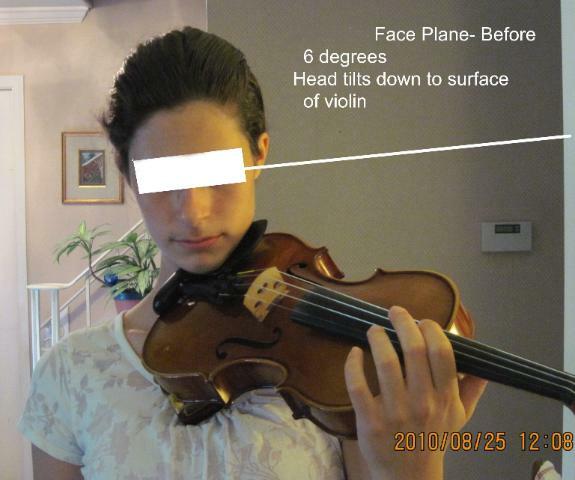 An incorrect chinrest shape led this young violinist to reach out over her instrument with her head to secure the violin. The very desirable curve at the back of the neck is lost. Discomfort results. The new chinrest has yielded a head that is lightly balanced against the back ridge of the chinrest. 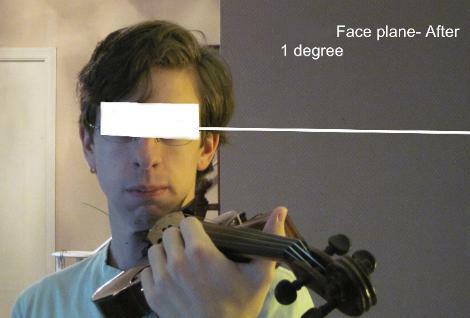 Head weight is no longer constant, but rather, it is added into the chinrest as needed (as in shifts down or in dramatic vibrato). 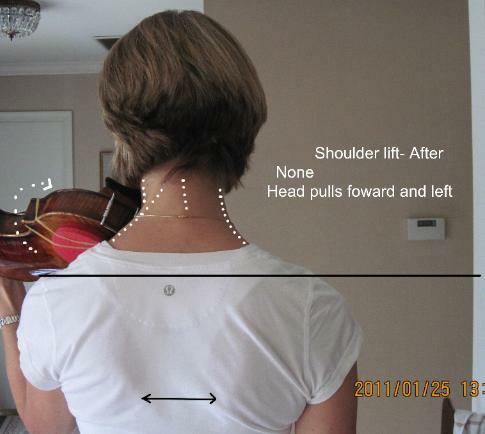 The back of the neck has regained some of its healthy, flexible curve. 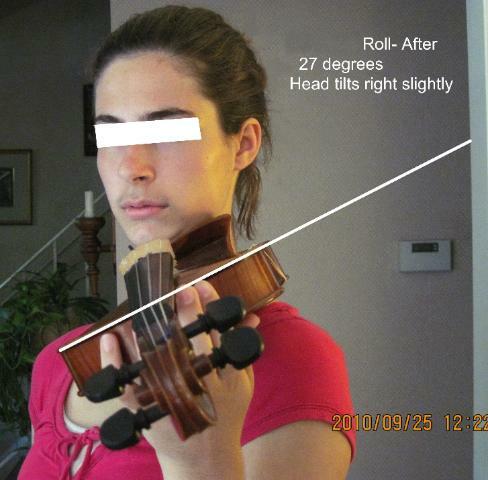 This player's equipment has "asked" her to not only raise her left shoulder but also to tilt her head left. She could only play for minutes before hurting badly. A chinrest of a different height and shape and also getting rid of the hard shoulder pad have led to huge improvement in playing angles. 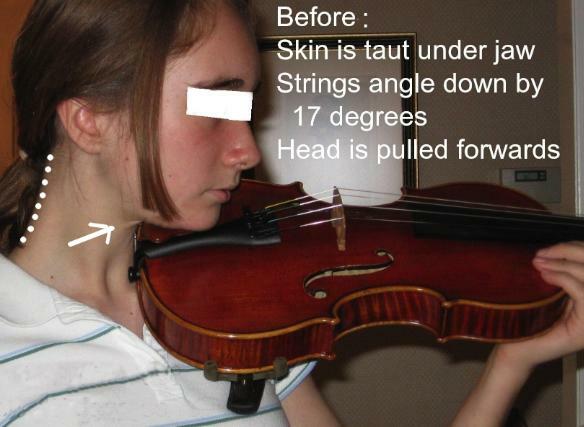 The head angle is straighter up, the shoulders are released, and the violin is flatter. Playing time pain free has improved. Years of playing on poorly-fitted equipment almost led this player to give up playing. Notice that her left shoulder is pulled high and her head leans left. 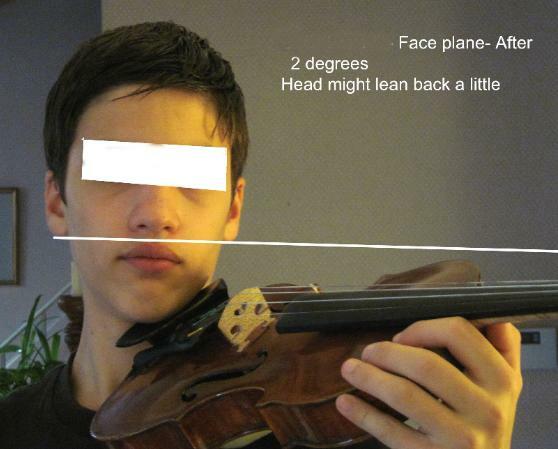 While head angle is still not ideal, shoulder height is now equal side to side. These angles are improvements moment to moment with no coaching in what ideal angles should be. More neutral angles just happen if equipment suits the individual.